Scin was born in 1982 and she was special from the start. Kathy and she finished her championship winning Specialty Best-in-Shows and Group placements. By the end of 1984, as a "specials", she had an outstanding record. It was then that Dorothy Hageman became Scin's co-owner and Barbara Humphries her handler. Little did we know that in the next year,1985, the winning she would do, would gain her a prestigious award. because she was the top winning Non-Sporting dog for 1985. Kathy, Dorothy, and Barbara attended the award's dinner, see photo at the bottom of this page. Although Scin's show career was extremely successful it was decided to put her show carreer on hold. In 1986 she was semi-retired and stayed home to attend to maternity duties. See pups from her first litters on the following pages. 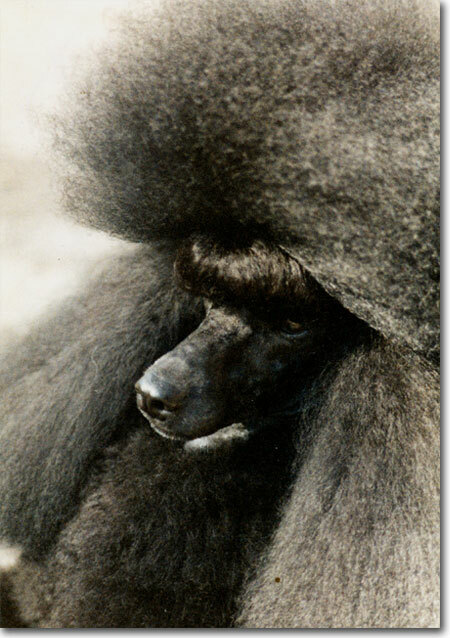 These breedings produced numerous Champion boy and girl puppies. We were extremely pleased with these pups! In 1987 Scin was in stunning condition and we decided to show her at the PCA National Specialty. To our surprise she won BOB! Her daughter went on to win BOB in 1989, the only mother-daughter (Ch. Bar King's Shimmer of Wildways) combo to win BOB at the PCA National Specialty in all three varieties. Shimmer is pictured with her BIS ribbon in her mouth on this sites "HOME" page. In the years since Scin and her get have figured predominately in many a pedigree. Over the many years of breeding there have been accolades from fellow breeders and judges. Looking back please mention at least one Miniature Poodle not owned, bred or shown by yourself, which you particularly admired. Which one of those you have been involved with was the best?" "Ch. Wavir Hit Parade, Ch. Bar King's Scintilla, and Ch. Parade Presentation come to mind as excellent representative of their variety for their type, elegance and showmanship..."
"...Ch. Bar King's Sugar Bear Brown led me to Ch. Bar King's Scintilla who led me to today and all her children, grandchildren and great-grandchildren, nieces and nephews who have graced my home and continue to do so. And, of course, of all these "Cynthia" (Scintilla) has to be the most influential. Her show career was short and yet she became a legend. She comes close to leading the top producers list, and members of her family are the leading producers every year." "I think that Ch. Bar King's Scintilla was very beautiful and important in her contribution to the breed..."
In the pages that follow we will show you more about Scin as well as other Top-winning and Top-producing dogs it has been our pleasure to live with. 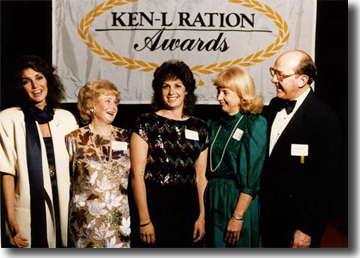 Here's Kathy with actress Jennifer O'Neill, the guest speaker: Dorothy Hageman, Scin's co-owner: Barbara Humphries, Scin's handler: and Thomas Rohr, Ken-l Ration Professional Sales Manager, the night of the 31st Annual Ken-l Ration Award dinner (Quaker Oats Inc.), held February 8, 1986 in the Empire State Ballroom at the Grand Hyatt New York Hotel.